One day I was bored, so I surfed Crunchyroll for an anime that actually interests me. My standards of anime were low at the time, due to my lack on interest. But then, I found this. For some reason, it captured my attention and made me cry, but now I don't recall why I did. Main point after all that blabber, it's good, watch it. It was a fun anime to watch. It was little too short for me. I would of loved to seen more and more abilities maybe. The story was very catchy and heart warming as it tied all-together. I highly recommend this anime to anyone that likes mecha and strong storylines. The story is about a young kid name Joseph Carter "Joey" Jones who lives with his Grandmother in Central City, California ( it looks almost like South San Diego) and working at a restaurant wanting to get a toy robot he wanted called Heybo, which he couldn't afford but fate would have it he manage to get broken down Heybo abandoned by a school bully, he gone home to fix it, and a strange lightning hit the toy robot transforming the toy robot into a Giant Robot that can be control by a device on his hand. which Joe rename the Robot Heroman all of a sudden Alien Race of insectoid beings invading Earth known as Skrugg and the only defense they have is Joe and his Robot Heroman. 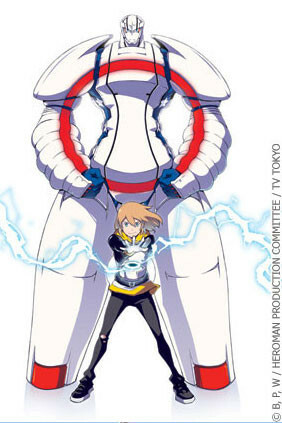 The Anime does seem to remind some people of Tetsujin 28-gō because it has kid who controls robot with a remote control but this one is more advance, the only difference is its not a Super Giant Robot.I understand Stan Lee created story under his Production company POW! Entertainment with the help of Bones who we all know made some good shows in the past even you may notice Stan Lee appears in the story like in the Marvel Cartoons and movies. One thing notable about Heroman is that the plot runs faster than most other anime of its type. An arc that would last a whole season for other animes finishes in around 8 episodes or so, making the plot very dense while maintaining attention towards detail and not letting the audience fall behind. There seems to be some fillers here and there but the author successfully connects all the dots and gives every single episode their own meaning, contributing to the climax in the very end. The plot itself doesn't have much surprise to it, but it has that down-to-the earth time tried straightforwardness to it that just keeps your eyes stuck onto the screen even when you know exactly what happens next. The "mecha" of the series, Heroman, feels very organic to the eye and is more a mechanic superhero than an actual fully mechanical robot. Viewers who is expecting more of a mecha show might want to take note. However this anime DID star in the famous japan mecha all star game Super Robot Wars so yeah there is quite some robot to it. All in all, a good, solid piece of work with a lot of soul put into it. Also Stan Lee does cameo throughout the series, throughout as in a LOT here and there. Try looking for it. This anime was really awesome. Being a robot fan I was possibly going to enjoy this but I also really identified with the main character a lot. The story at some times was a bit strange but let me tell you there is plenty of action. Didnt like the ending to much. Left some holes....but still watch it! This is an amazing story of a young boy who acquires the power and a great friend to protect the planet. The creative genius of Stan Lee and the company that brought you Eureka Seven and Xam'd has created a true anime classic-to-be. This show has cool battles, great music, a good story, and unforgettable characters. If you like all of these descriptions then this is the anime that YOU MUST WATCH!! !